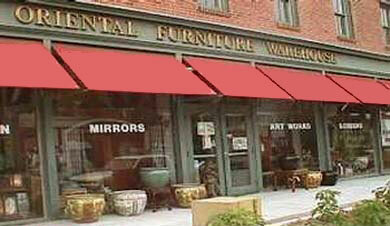 Welcome to OrientalFurnishings.com. Direct importers of fine Asian furnishings and décor, since 1984. That’s over 30 years in business as a “hands on,” family run operation. You will still find Bill and Bette overseeing the purchasing, selling and shipping of all orders, from start to finish. Bill has been traveling to Asia for years, and has a trained eye for quality and detail. Bill knows what he’s looking for and what customers want at Oriental Furnishings, and they’re always adding new items. Stop by our warehouse in Norwalk, CT, and experience firsthand, the touch and feel of authentic, fine furniture and décor, old and new.We are open Monday- Saturday 10am-6pm. Sundays Closed. Browse porcelains, stands, furniture, artwork, sculptures of bronze and stone, lamps and lighting - and much more. These are top quality pieces from China, Indonesia, Tibet, Thailand, Korea and Viet Nam. Or shop online at home for more than 1,000 items available on our website: orientalfurnishings.com and have your order shipped quickly, safely and economically. Was voted “Best of Westchester,” in the Westchester Magazine, New York edition. Our wares have been featured in the Smithsonian Museum Orchid Show, in 2011. Oriental Furnishings is also known as the go-to place in the entertainment industry. Our furniture and other items have been used for TV shows, Plays and movie sets. YOU CAN REST ASSURED THAT WE ARE TIME TESTED IN THE COMPETITIVE NEW YORK TRI STATE AREA. WITH OVER 30,000 CUSTOMERS AS OF 1984.WE GRANTEE YOU WILL BE PLEASE AND CAN SHOP IN CONFIDENCE IN OR OUTSIDE THE TRI STATE AREA. Whether you’re on our website, or in our bricks and mortar store, it’s an Asian import bazaar, at your fingertips! You’ll find exotic sculpture and art, many styles of stands, handmade lamps, fine porcelains and statuary. Custom orders are available also, in rosewood or painted lacquer finishes, with many styles and colors to choose from. Bill and Bette have been sketching up custom designs, for their clients, since 1984. The fine custom order is a great way to customize your home, your way. If you can imagine it, we can make it happen. Thank you for shopping at Oriental Furnishings, we know you’ll enjoy your experience with us!